Major General Errol R. Schwartz, the first black adjutant general for the District of Columbia, was born in Georgetown, Guyana in 1952. In 1972 Schwartz arrived in the United States, following his brother and sister who emigrated from Guyana to enroll at Howard University. Their own quest for higher education motivated Schwartz to begin to investigate enrolling in a college and focusing in engineering. Later in 1972 Schwartz entered TESST, a private non-profit technical college in Baltimore, Maryland but which had a campus in Hyattsville, Maryland, just outside Washington, D.C. Schwartz became both a full-time student and a full-time employee handing all external and internal calls for the Crestwood, an apartment complex in Washington, D.C. After completing the two-year program at TESST and graduating as an electrical technologist, he applied to Federal City College (FCC) in Washington, D.C. on the encouragement of engineering professor Dr. Gene Emmanuel, a Crestwood resident who taught at FCC. While studying at FCC, Schwartz also worked as a television repairman. To fast-track his U.S. citizenship, Schwartz he took a break from Federal City College and enlisted in the District of Columbia Air National Guard in 1976. When he returned to school in 1977, FCC had become the University of the District of Columbia (UDC). Schwartz enrolled in the university’s Reserve Officer Training Program (ROTC) and by 1980 when he graduated, he received a Bachelor’s of Science degree in electrical engineering and was simultaneously promoted to second lieutenant. Schwartz later enrolled at Central Michigan University where he earned a Master’s degree in business management (1984) and then the National Defense University in Washington, D.C. where he received a second Master’s degree (2006) in national security strategy. Within 18 months of his graduation from the University of the District of Columbia, Schwartz moved from a technician to project leader on the VIP aviation communications system for aircraft at the National Security Agency (NSA). He also rose in the ranks of the District of Columbia Air National Guard serving as Battalion Commander of the 372nd Military Police Battalion, Commander, 74th Troop Command, Deputy Commanding General, District of Columbia National Guard, and Director of the National Security Incident Response Center at Fort Meade, Maryland where he was responsible for providing real-time indications and warning of cyber incidents affecting the U.S. National Security Information Systems. On September 30, 2005, Schwartz was promoted to Brigadier General. In 2008 President George Bush appointed Schwartz Commanding General of the District of Columbia National Guard, the only National Guard organization in the nation directly under the jurisdiction of the President of the United States. Other National Guard organizations report to state governors. The position is equivalent to the Adjutant General (TAG) in the individual states. In 2009 President Barack Obama reappointed Schwartz to the Commanding General post. As Commanding General, Schwartz led 2,700 soldiers in the District’s Army and National Guard units. In 2017, just before his inauguration, President-elect Donald Trump announced that Schwartz would be retired on January 20. The announcement abruptly ended his 40-year career in military service. Schwartz now focuses on addressing the needs of at-risk youth from ages 16-18 years old through the Capital Guardian Youth Academy. 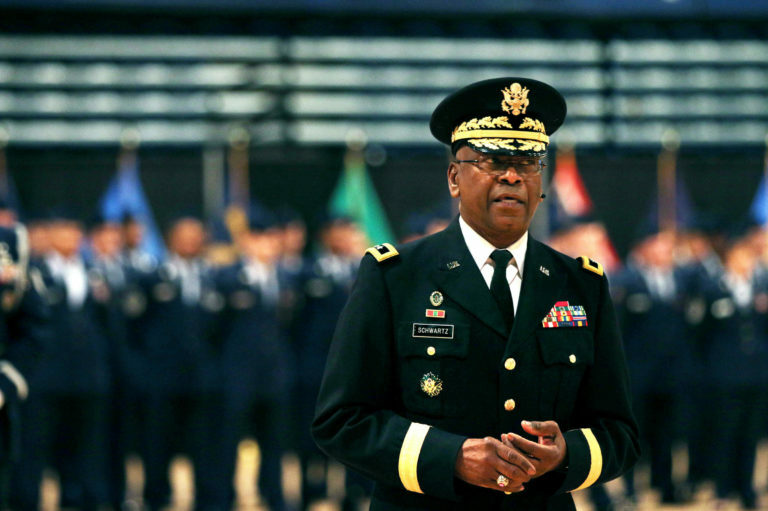 The general also serves on the board of trustees of the University of the District of Columbia. Major General Errol Schwartz: Biography,” National Guard Bureau, http://www.nationalguard.mil/portals/31/Features/ngbgomo/bio/1/1513.html “UDC: "We Are Black History: Major General Errol R. Schwartz.” Major General Errol R. Schwartz, University of the District of Columbia, https://www.udc.edu/2017/02/13/errol-schwartz/; Peter Hermann and Aaron C. Davis, “Head of D.C. National Guard Removed from Post in middle of inauguration” Washington Post, January 13, 2017, https://www.washingtonpost.com/local/public-safety/commanding-general-of-dc-national-guard-to-be-removed-from-post/2017/01/13/725a0438-d99e-11e6-b8b2-cb5164beba6b_story.html. Major General Errol Schwartz: Biography,” National Guard Bureau, http://www.nationalguard.mil/portals/31/Features/ngbgomo/bio/1/1513.html “UDC: “We Are Black History: Major General Errol R. Schwartz.” Major General Errol R. Schwartz, University of the District of Columbia, https://www.udc.edu/2017/02/13/errol-schwartz/; Peter Hermann and Aaron C. Davis, “Head of D.C. National Guard Removed from Post in middle of inauguration” Washington Post, January 13, 2017, https://www.washingtonpost.com/local/public-safety/commanding-general-of-dc-national-guard-to-be-removed-from-post/2017/01/13/725a0438-d99e-11e6-b8b2-cb5164beba6b_story.html.